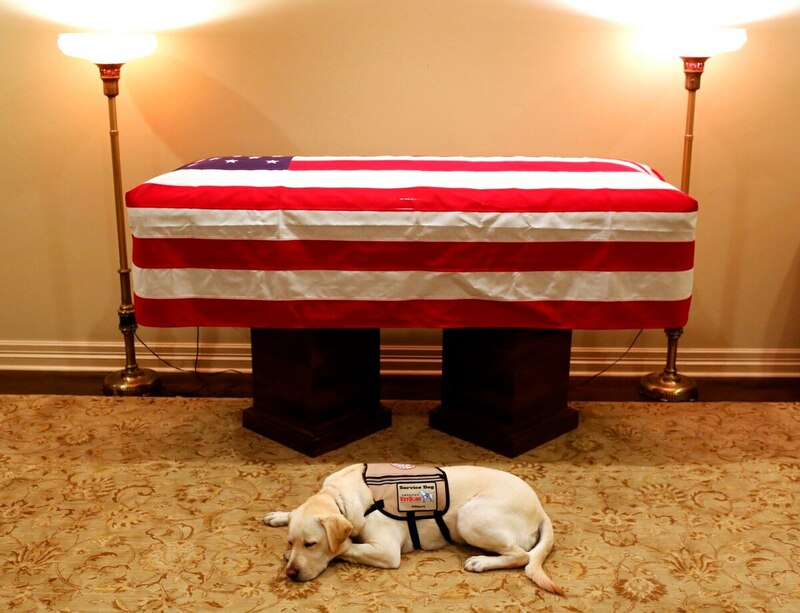 Sully, the service dog that has been companion and helper to former President George H.W. Bush, now has a new mission to serve military service members. The Labrador retriever will join Walter Reed National Military Medical Center, the late president’s son, former President George W. Bush, said in an Instagram post. “As much as our family is going to miss this dog, we’re comforted to know he’ll bring the same joy to his new home, Walter Reed, that he brought to 41,” Bush wrote, referring to his father, who was the 41st U.S. president. Sully is shown in front of the late President Bush’s flag-draped casket. The dog is reportedly traveling with the casket on the flight to Washington, D.C., where tributes and services are planned in honor of Bush, who died on Friday night at age 94. He will be buried on Thursday in Texas, the Associated Press reports. Sully came to the Bush family this summer, after training at America’s VetDogs, a nonprofit organization that prepares dogs for service to veterans and first responders. The president had a form of Parkinson’s disease and was often shown in a wheelchair toward the end of his life. Sully is trained for tasks such as opening doors, picking up items and summoning help. “Sully will be joining the Walter Reed National Military Medical Center’s Facility Dog Program,” the organization posted on its Facebook page. Sully will work with other dogs assisting with physical and occupational therapy to wounded soldiers and active-duty personnel during their recovery at Walter Reed in Bethesda, Maryland, the post said. Sully is named for former airline pilot Chesley “Sully” Sullenberger III, who famously landed a passenger jet on the Hudson River during an in-flight emergency, saving all passengers and crew in 2009. The dog has an Instagram account, sullyhwbush, with about 117,000 followers. In one post he is shown with U.S. Marines, participating in their Toys for Tots program. The hashtags tell their own story about Sully: #goodboy.